The SustainRCA Show & Awards 2014 preview was at the heart of my London Design Festival. The event celebrates the work of some of the brightest of this year’s graduates from the Royal College of Art, addressing the big social and environmental challenges of our day. This year is the strongest yet, with more than 100 applicants, 60 students shortlisted and 35 selected as finalists from across all RCA. This was the first opportunity to see all the finalists together in a curated show, and together they present a powerful body of work charged with potential. There are projects that take an innovative look at waste, water and other resources, but collectively the works show that sustainability is about more than efficiencies or climate science. Rather sustainability is about our values and relationships with one another, and the environment, in its broadest sense. In fact many of the tangible things we associate with sustainability are the symptoms or representations of imbalanced relationships that are at odds with values that many of us identify with. An independent, expert judging panel had spent the day deliberating over who to crown in each of four categories under the broad theme, “Looking Forwards“. The theme suggests purpose and action. The first category, Moving Minds confronts head-on the apathy that mention of ‘sustainability’ often generates. Works in this category might present the viewer with some uncomfortable realities or challenge the viewer to think about things we often do not. 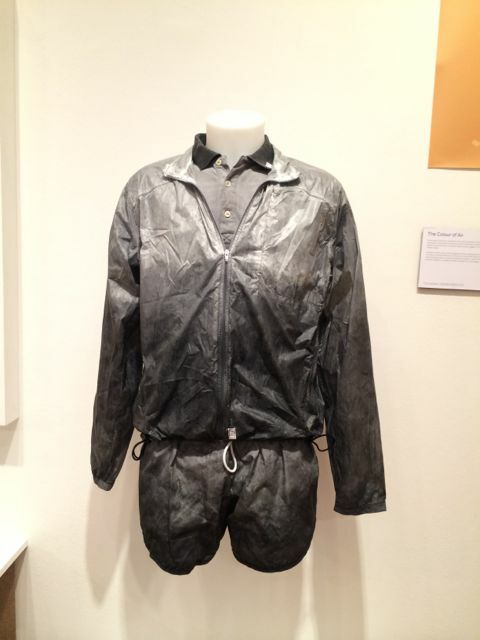 As I walked into the Show, having criss-crossed London on my bike that day, I immediately connected with Tino Seubert’s The Colour of Air which filters Particulate Matter (PM) from car exhausts to produce lead for pencils, ink, or, as exhibited, dyes an outdoor sports outfit, PM_DYE. The smog produced by the incomplete combustion of fossil fuels polluting the air we breathe becomes tangible, even wearable, to those who inhale it everyday. Wiping my ‘glowing’ brow, my handkerchief collects enough PM to make a contribution to Tino’s next piece, and a reminder that London’s record on air pollution is dire. Nearby, another warning, this time of the often unseen impact of our relationship with so-called disposable plastics. Alice Dunseath’s, Plastic Shores, are three stop-motion animations from bits of plastic found washed up on shores in Britain and Hawaii. A simple, colourful story that reveals the impact of a throw ‘away’ culture in our closed, connected eco-system. Runner-up or Honourable Mention was given to Peter Shenai’s Change Ringing. The haunting dissonance of six bronze bells cast in shapes mathematically derived from temperature data over the twentieth century sound the imbalance of our changing climate. Winner, Marcin Rusak’s Flowering Transition explores the significant impact of flowers cultivated for the global cut-flower industry. with intensive use of fossil fuels, pesticides, water and genetic redesign. The final chapter of Rusak’s design research project presents Flower Monster, the 3D-printed model flowering chimera of commercial virtues. Beware the monster we create in the search for the superlative colour, scent, shipping tolerant bloom. Inspired Products emerge as a response to category one: once you have captured people’s attention, you need to offer them something they can do, otherwise a sense of impotence floods in. Dunseath’s Plastic Shores animations were commissioned for a feature length documentary of the same name. In 2011 global plastic production reached 300 million tonnes, over a third was for the disposable packaging industry. An estimated 6 million tonnes of litter enters rivers and oceans every year. As well as litter, every ton of PET produced for plastic bottles creates around three tonnes of CO2. By way of response, Pierre Paslier, Guillaume Couche, Rodrigo García González’s Ooho!, winner of this category, and of the Lexus Design Award 2014, is an alternative way of packaging water inspired by nature’s use of membranes. Ooho! uses brown algae, calcium chloride and the surface tension of the water to create a double gelatinous membrane; a process known as “spherification”. A simple, cheap, biodegradable (even edible) alternative to disposable plastic bottles and as it is currently developed under Creative Commons license you can DIY at home! Solutions for Society is about scaling up interventions from products to systems and services that facilitate a fairer, more ethical and sustainable society. The winner, with double honours, was Pierre Paslier‘s Advanced Activism, an open-source toolkit to inspire activists and campaigner. Inspired by street art, the irreverent and playful tools include a remote-controlled drone (pictured right) to flyer hard to reach places, literally finding new platforms for alternative voices. The instructions are available on streettoolbox, a collaborative platform for activists underpinned by the knowledge that debate and plurality are fundamental to healthy democracy. Visionary Processes are new collaborations to facilitate Solutions for Society by stimulating innovation, or making production better. Runner up in this category was Nell Bennett’s Coral3, whose sacrificial alkaline structures are designed to be deposited by divers around coral reefs to help neutralise ocean acidification, one of the causes of coral reef degradation. Designed as part of a conservation programme that provides education, and sustainable livelihoods for the local communities, the sacrificial sculptures are the centrepiece of a system that engages and empowers a wide network of stakeholders. Winner Hana Mitsui’s New Value of Waste, transforms fabrics using a technique derived from a traditional Japanese process, ‘sakori’ to extended the life of worn fabrics. Waste fabrics are shredded into thin strips and then woven over a fresh warp creating new luxurious clothes with distinct textures and patterns. This tale of rags to riches highlights the value that is lost when we are so quick to dispose, and that can be restored with ingenuity and creativity. There is much at SustainRCA Show & Awards to challenge, provoke and inspire, the great joy of the show is that the work also offers positive and creative steps to move forwards. Visit the show, and the momentum will be infectious. 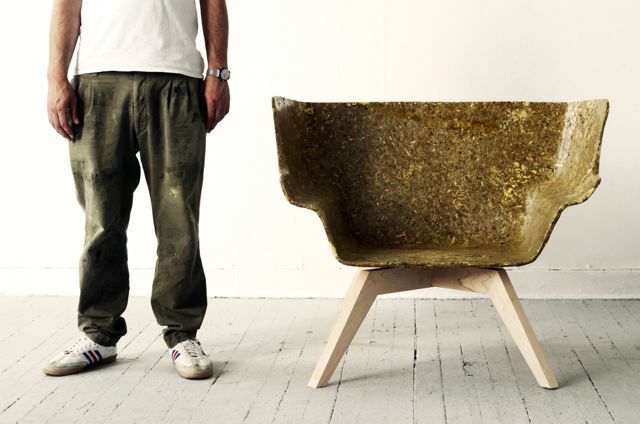 The SustainRCA Show and Awards runs from 18 September–3 October, Royal College of Art, Kensington Gore, London SW7 2EU. Edinburgh School of Art graduate, Kizis’ design approach explores not only the material, but also the systems and processes that support the material’s extraction, the product’s manufacture, its distribution and disposal. As we approach Global Peak Oil, Kizis wanted to find an alternative to oil-derived plastics, without the associated negative environmental impacts. He developed a composite of Greek artichoke thistle fibres and a bio-based resin, made from waste cooking oil. Artichoke Thistle (Cynara Cardunculus) grows readily without the need for pesticides or irrigation. Grown easily in a Mediterranean climate, he sees it as a way to encourage local production in his home country, Greece. The material is created from renewable, sustainable plants, and is 100% biodegradable. The Artichair dining chair, pictured above, is moulded and set on simple wooden legs. Influenced by a classic Eames chair, the material is celebrated in a clean, contemporary shape. The lounge chair is more generous in its proportions, and with warm honeyed tones it seems to invite you to linger. 1. You are currently featured in the Plausible Implausible exhibition. Can you please tell us more about how you started to experiment with agricultural waste, turning it into new materials? The whole project started as an investigation into alternative ways to redevelop the Greek economy after the financial crisis. The main idea was to take advantage of local natural resources to design and make products. After lot of research I ended up using the Artichoke Thistle, which is produced for biofuel purposes at extremely low cost, and the waste was the starting point for this project. What is fascinating about this process and all projects on the same principles, is the journey from nothing to something of value, or if you wish, from something useless to something useful. 2. What do you think is people’s perception of design when using a new material? 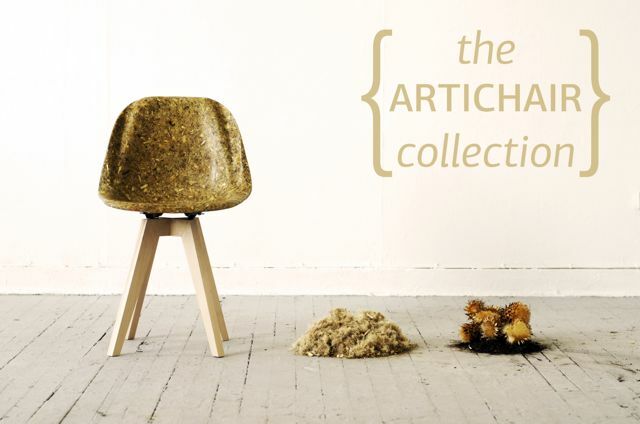 How do you feel the Artichair fits into this rapidly evolving design scene? In my opinion, there is a totally different way of design-thinking behind so called “materiality”. Instead of traditionally thinking what material could we use to built a specific project, the process is now reversed: what could we built with a new awkward material that we have in our hands? In this way we explore new potentials, new designs, and new concepts. I believe that Artichair really fits this developing scene. My ambition, though, is to go further and instead of being limited to a craft scale, or cool experimentation, to be part of a sustainable mass production system which effects considerably more of our lives. 3. What future do you envisage for your material? Do you have any large scale plans for it? The future plans are quite big and exciting. I was lucky enough to be approached by people that saw this as an opportunity, that are sensitive in environmental issues, and very open to giving young people, and new designers a chance. I am now to the Schaffenburg office furniture company from the Netherlands. We are now designing a new chair which they are going to put in production soon. 4. Can you see your material being used in other industries? 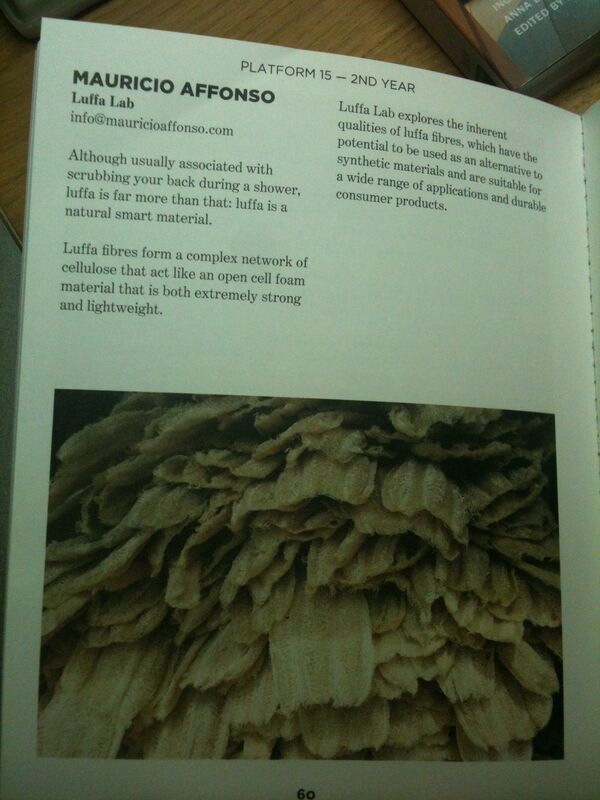 I could see the material being used in other industries, particularly in interiors and panels. What I would find really interesting, though, is a collaboration with chemical engineers to extract the cellulose from the plant and make a bio-plastic suitable for injection moulding techniques. This would really increase range of applications for the material in different industries. 5. 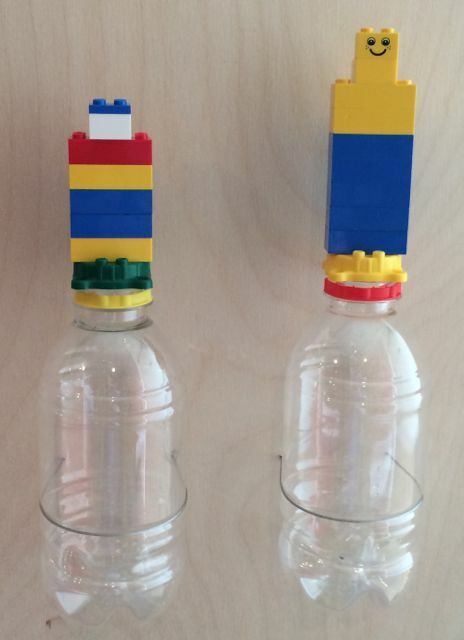 Are you planning on experimenting with any other waste materials in the future? Experimentation with other waste materials is a way I would like to continue to work, but that does not mean that I will not continue to work with more traditional commercial techniques. At the moment, I am working on a project about pendant lights, experimenting with wood ashes, waste polystyrene boxes and bio-resins. Kizis’ work is part of the Plausible/Implausible exhibition currently on show at the SCIN Gallery until 3rd October. The SCIN Gallery and Carefully Curated are delighted to announce their collaboration bringing you a fresh perspective and surprising materials. Early 2015, the SCIN Gallery will launch their Green Room, which will be located in the existing ground floor of the gallery. Visitors (architects, designers, specifiers and students and the public) will be welcome to investigate and research cutting-edge materials in the resource centre, supported by a stimulating agenda of seminars, creative workshops and product launches. It promises to be a lively, engaging and thought-provoking programme, uniquely focussed on promoting sustainable design and construction. Carefully Curated seeks and shares joyful things for everyday living for places and spaces for one or many people to eat, work, sleep, refresh and play. Carefully because I care about where things come from, how they were made and by whom. Curated because our space is a collection we each arrange. Our spaces are a powerful reflection of who we are and our values. Carefully Curated celebrates products with provenance from designers and makers, whether small or large scale, who have made things with honest form and function for us to enjoy for many years. Together, SCIN Gallery and Carefully Curated want to share stories of new materials, new manufacturing processes and new technologies that are innovative, engaging and better alternatives. Watch out for the wow factor, but perhaps not as you know it! The SCIN Gallery’s latest exhibition “Plausible, Implausible” runs until September, at Morelands 27 Old Street, London, EC1V 9HL. 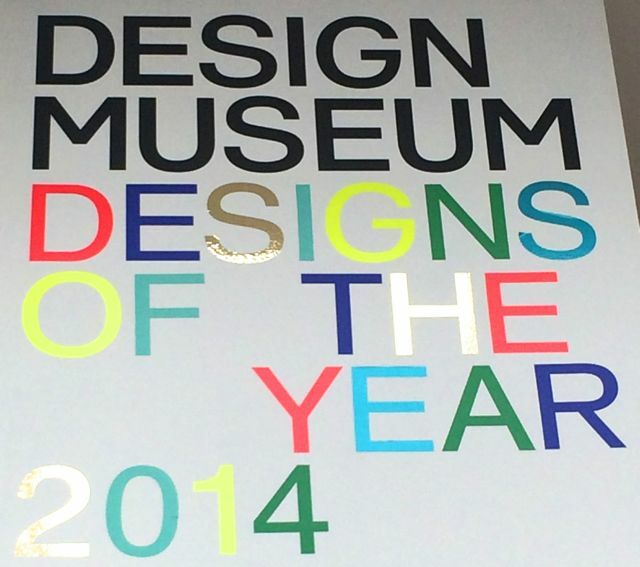 The Designs of the Year, now in its seventh year at London’s Design Museum, capture the desires, concerns and needs of the moment. This year’s exhibition of the most innovative international design projects of the last 12 months across seven categories: architecture, product, fashion, furniture, graphics, digital and transport is stimulating, as ever. Whether through materials, technology, or design, the projects and products simply help make life better. The themes: Connect; Thought; Delight; Care; and Situation provide rough clusters of projects, with Care for the environment influencing many of the designers. Two projects tackle the huge amount of discarded plastic blighting landscapes and harming eco-systems. 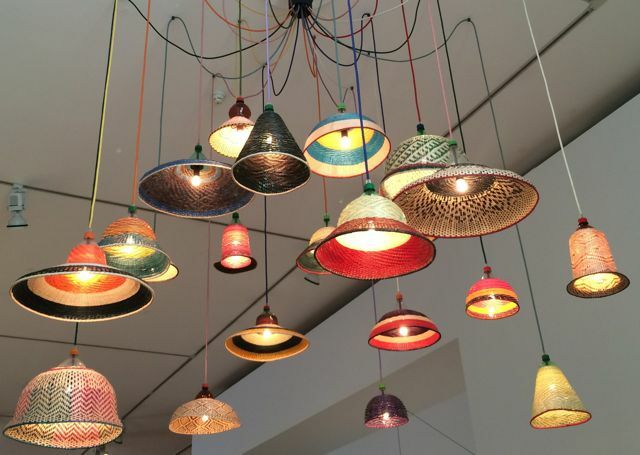 The PET Lamps (which caught my eye at Decorex 2013) are made from plastic bottles washed up along the Amazon river to make joyful pendant lights. Equally colourful, and playful, Clever Caps are bottle tops that can be used as building blocks. Bottle tops can be thrown into the toy box rather than the rubbish bin. A redesign that adds fun to function, and can be played with forever. The red Ripple Table, designed by Benjamin Hubert, is made out of corrugated birch plywood. Ply is corrugated through pressure lamination, a new process developed by Benjamin in collaboration with Corelam. The corrugated ply is topped with a flat sheet and sits on A-frame legs. 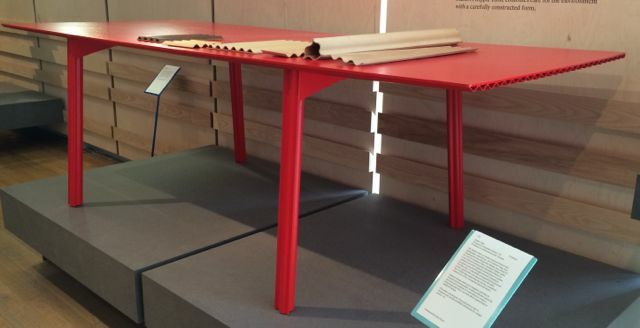 The 2.5m table weighs only 9kg, and uses roughly 70% less material than a normal timber table. 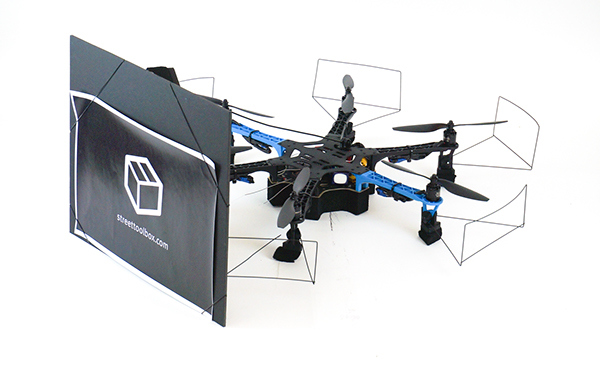 Lightweight and easy to transport in flat-pack form, providing further economies of energy and materials. Mauricio Affonso’s final year project from the RCA Design Products programme, Luffa Lab, provides a Cinderella transformation of our humble bathroom friend, the luffa. Luffa is antimicrobial, biodegradable, lightweight, breathable, strong and highly absorbent. These natural virtues lend the material to surprising applications such as a low-cost splint made by compression-moulding and a water-based thermoset binder. 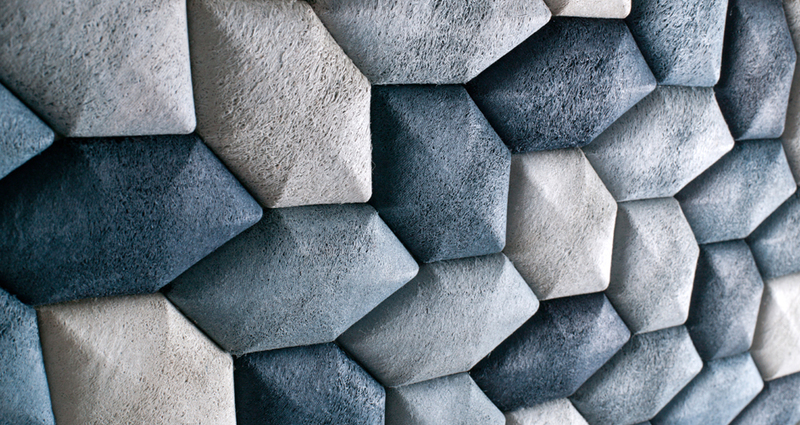 Mauricio’s Luffa Acoustic Tiles caught my eye at the Show RCA last summer, and then at the SustainRCA Awards 2013, where Mauricio won the Visionary Processes category. The tiles get their distinctive tonal colour from soaking up toxic indigo dyes out of the wastewater from denim production, preventing the harmful dyes being discharged. Once finished the tiles act as sound insulation, with a soothing aesthetic. The Alchemist’s Dressing Table is a set of elegant utensils and vessels to explore the cosmetic properties of flowers, herbs and minerals. 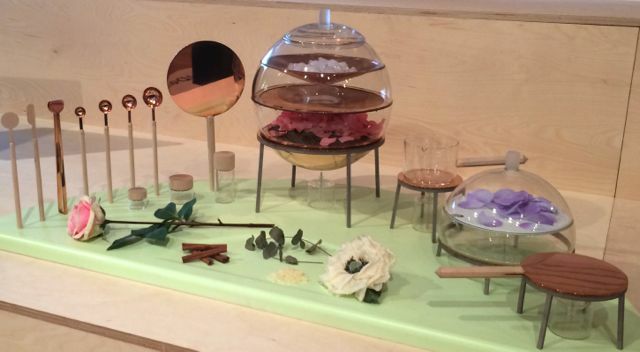 Lauren Davies, a fellow graduate of the RCA’s Design Products programme, and finalist at the SustainRCA Awards 2013, used traditional materials such as copper and cork to craft a most understated, but luxurious, kit for DIY organic skin care. The work is intended as a dialogue about nature and materials. It lays bare what we use on our skin with beautiful transparency. Transparency is the theme of two technology exhibits. Phonebloks has just been announced the winner of the social vote. As the name suggests Phonebloks have a vision of consumer electronics that are modular so that products are easy to repair, easy to upgrade and long lasting. Starting with mobile phones, Phonebloks want to change product development and production to end planned obsolescence and reduce electronic waste-streams. Demand for these increasingly scarce resources is driving the ethical and environmental tensions that are the focus of Friends of the Earth‘s Make it Better campaign. Phonebloks have reached 380million people on social media, so they have sparked a lot of interest, and caught the industry’s attention. 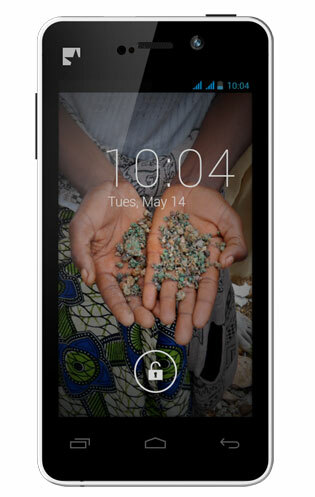 Phonebloks have just announced a partnership with another Design of the Year exhibitor, Fairphone. The Fairphone, from a social enterprise funded on Kickstarter, is a a smartphone where every aspect of its lifecycle is open and ethical. From conflict-free materials to safe manufacturing conditions, fair wages and worker representation to repair guides with iFixit, Fairphone wants to change the way products are made, so we tread lightly, and with awareness. You can order yours now. After ‘T” for transparency, it is “U” for the urban commute made easier with two bicycles. 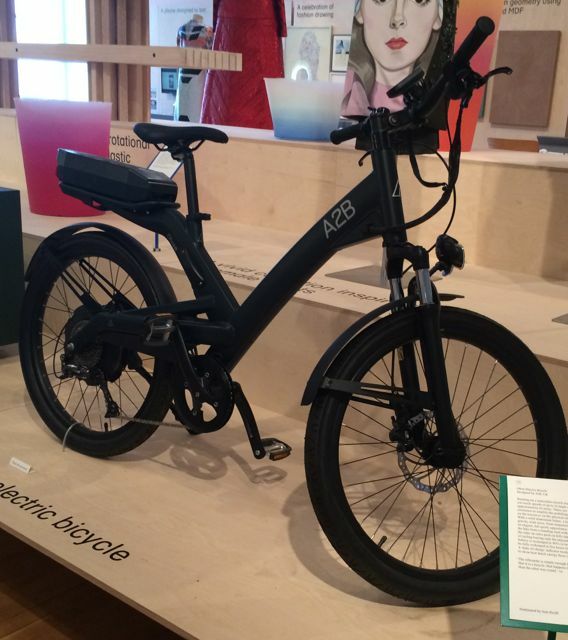 The Obree electric bicycle runs on a removable lithium ion battery that is 80% charged in two hours. The bike can reach around 15m.p.h, run for 62 miles and propel from a standing start or just give you a boost uphill. It looks like a grown-up BMX, so you can arrive looking sporty, but cool, in more ways than one. 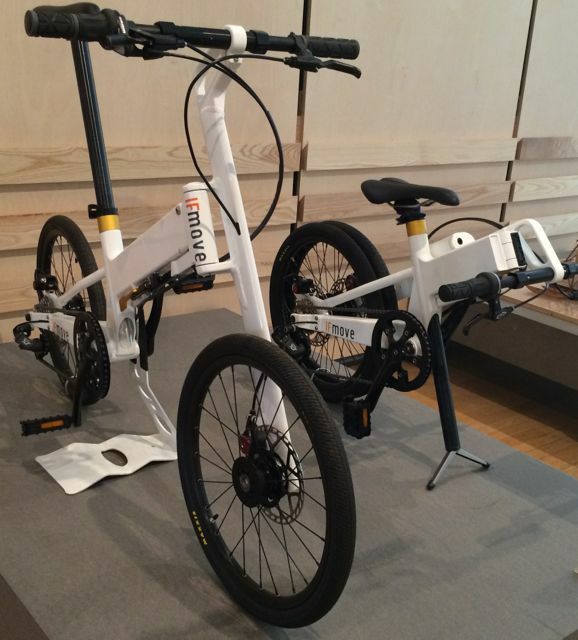 The ‘IF’ in IFmove Bicycle stands for integrated folding. At 10kg, it is lightweight and can be wheeled rather than carried. The covered chain keeps grease and grime off those business casual cloths. The addition of a retractable Plume Mudguard will keep the spray off your suit on a rainy day too. For the full fit out you could get a pair of the appropriately named reflector “Geek” bike shoes from Tracey Neuls. The shoes contain a small piece of reflective material, for safe cycling (or walking) at night. The whole shoe has been designed with cycling in mind, and now the ‘Fern‘ is a heel that you can cycle in. Smart, simple, and calling to my inner geek, and I don’t know if I can wait until Christmas for these shoes. For the (sub)urban commuter there are two cars on show. Super sleek curves, and light-weight carbon fibre frame and seats boost the aerodynamics of Volkswagen’s XL1 Concept car, winner of the Transport category Coupled with a highly engineered dual diesel-electric engine, the XL1 can travel 100km on just 1 litre of diesel, or 313 mpg on the combined cycle while emitting 24 g/km of CO2. It accelerates from 0 to 70kmph in just under 12 seconds and has a top speed of 99mph. Speedy as well as stylish, it sets the bar in conventional car design very high, and who can resist a gull wing door? The ME.WE Concept car, designed by Jean-Marie Massaud and Toyota ED2, is intended as a new concept in personal travel, “a car that reflects the values of forward-thinking individuals, rather than simply reflecting their social status”. Made of expanded polypropylene panels (100% recyclable) on a tubular aluminium chassis, it is 20% lighter (hence more energy efficient) than many similar size cars. The interior is bamboo (a fast-growing, natural material) and while not ‘roomy’ the car can be reconfigured to create more space. The back seat can fold under the front, and the tailgate can drop down like a pick-up truck. It is a playful (switching from 2 to 4-wheel drive) dialogue with many of the conventions of the automotive industry. Massaud aims to maximise pleasure, rather than status, balancing ME (individual freedom) with WE (responsibility for society). The CC’s edit is only a tiny sample of the fascinating and fantastic exhibits that demonstrate how our everyday lives are shaped by and experienced through design. The show asks the viewer “what is good design?”, the public voted for Phonebloks, not just a product, but a vision of a circular economy for that most ubiquitous of modern aids, the mobile. Please bear with me as I get a bit evangelical about the amazing properties of sugru, the super stocking filler, and its infinite applications, limited only by our imagination. So what is it? It looks and feels like play dough, but sticks to aluminium, steel, ceramics, glass, wood and some kinds of plastic. Mould it, and leave it over night at room temperature and it turns into flexible silicon rubber that is electrically insulated, waterproof, heat proof to 180 celsius and cold proof to -50 celsius. For an introductory peak at the possibilities watch this video from sugru. You can could customise your favourite tools to make those everyday jobs more comfortable and colourful. Our first experiments with sugru were understated and economic. We moulded a new handle to a favourite pan lid and repaired a fraying charging cable. The simple brilliance of sugru is how easy it becomes for us to fix everyday objects and extend their life, or make things work for us that little bit better. How novel to not be one size fits all, but one sugru almost fixes all. Not make do, but make me a better one! After an aborted attempt on the opening night, I made it to BOB on Saturday afternoon. As the sun shone down into the courtyard, there was quite a buzz, and it wasn’t just the boutique refreshments and high-octane entrance past a couple of Morgan cars. Spread over three floors, there was a wide range of exhibitors from Fletcher powerboats to natural beauty care. I made a beeline for Solidwool to admire their beautiful chairs made from a sustainable composite of UK wool and bio-resins. The material could be moulded into a wide variety of things, the chairs are just a starting point. Designed and manufactured in Devon, the founder Justin Floyd, wanted to combine his product design with support for Devon’s wool heritage. From the new to the old, vintage shoe lasts from the 1930s that have been recycled and remade into bookends, coat hooks, lamps, and even loo roll holders by White Dove and Wonder. It looks rather dashing in our downstairs loo! Next door was the cosy collection of blankets from Romney Marsh. The sixth generation of sheep farmers on the Romney Marsh in Kent hand-pick Romney and Merino fleeces which are hand-processed and woven in the UK by traditional weevers to create covetable cushions and throws. More furry fleeces are at the the heart of Penrose Products, makers of luxury bedding made from alpaca fibres and organic cotton. No chemicals or dyes are used in manufacturing the products, whose sleep performance rivals that of wool. Leaves foraged from parks and paths, as well as kitchen scraps are used to create Entanglewood‘s botanical prints on lengths of cotton fabric that have themselves often been salvaged or off-cut. The results are subtle, warm colours evocative of an autumnal walk, complete with the silhouette of the leaves themselves. The fabrics can be purposed as shawls, cushions or bedspreads. 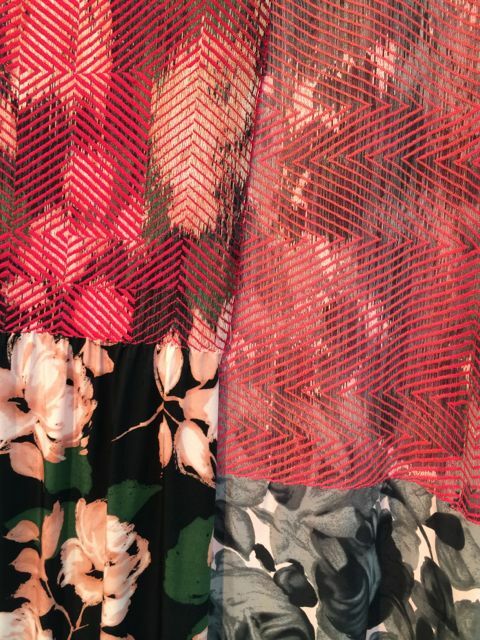 Outside of my regular remit (it was the weekend), I was drawn to Sara C‘s collection of clothes with their vibrant nature-inspired prints. Made from organic, natural fibres such as bamboo, cupro and peace silk, and eco-friendly dyes, and manufactured in the UK, the collection feels good on many levels. I could not resist a scarf. If it had been summer, I would have indulged in a pair of Mudlark sandals, too! With willow heels that are a bi-product of the cricket bat industry, and vegetable tanned leather, their credentials might be as good as they look. 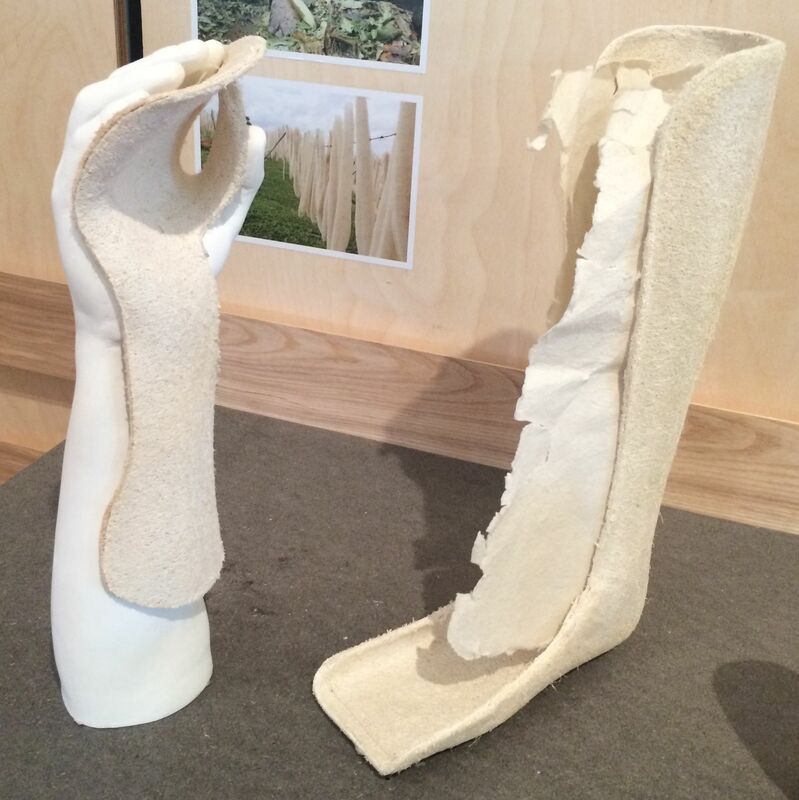 After Materials Moulded by Environments, I was uplifted by a sneak peak into the studio of Julia Lohmann, V&A Designer in Residence and Head of the Department of Seaweed. The studio is a magical space with long tendrils of seaweed drying overhead, rattan skeletons awaiting their seaweed sheath hanging from other bigger sculptures in progress and a selection of artefacts from masks and handbags to stained ‘glass’ and Urushi lacquerware. The Japanese influences are evidence of Julia’s long residency in Sapporo Japan. Julia’s research is exploring seaweed’s potential as a sustainable alternative to manmade materials such as plastic and glass or leather. 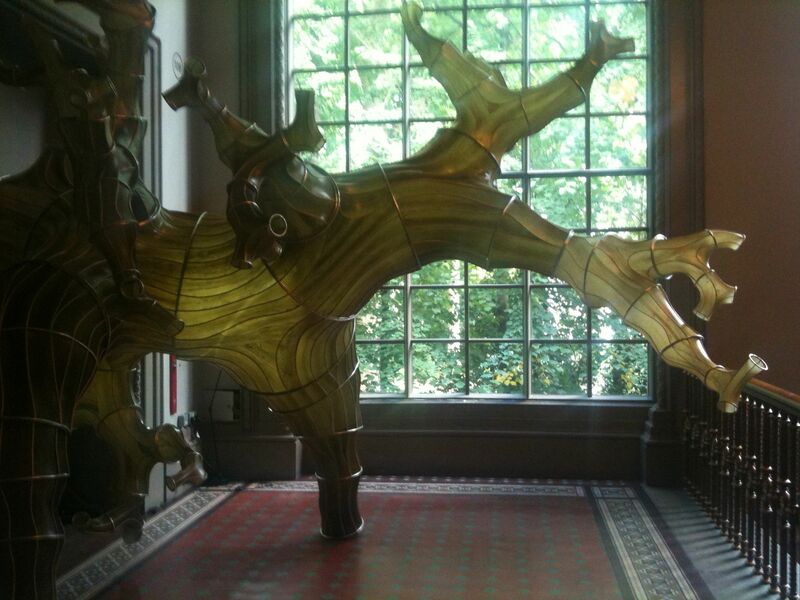 The Oki Naganode installation currently on display in Gallery 108 at the V&A shows seaweed’s potential as a design material. This huge installation has been made from Naga Kombu, Japanese seaweed, hand stretched over a cane frame and fused into position. The material qualities of the marine plant vary, but the wonderful warm colours, and textures are inviting to the touch. The lampshades created from crinoline rattan cages covered in seaweed that has been cut with a delicate filigree cast a gentle glow. During her current residency at the V&A, Julia is able to compare seaweed’s qualities of colour, texture, tensile strength, malleability and stability with other materials and artefacts in the V& A’s collection, and analogies in creative and technical processes used to turn materials into objects. 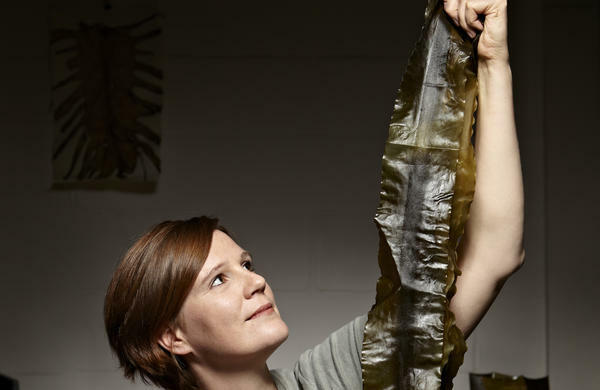 Julia currently imports the seaweed she is working with from Japan where it is cultivated on a commercial scale for the food industry. 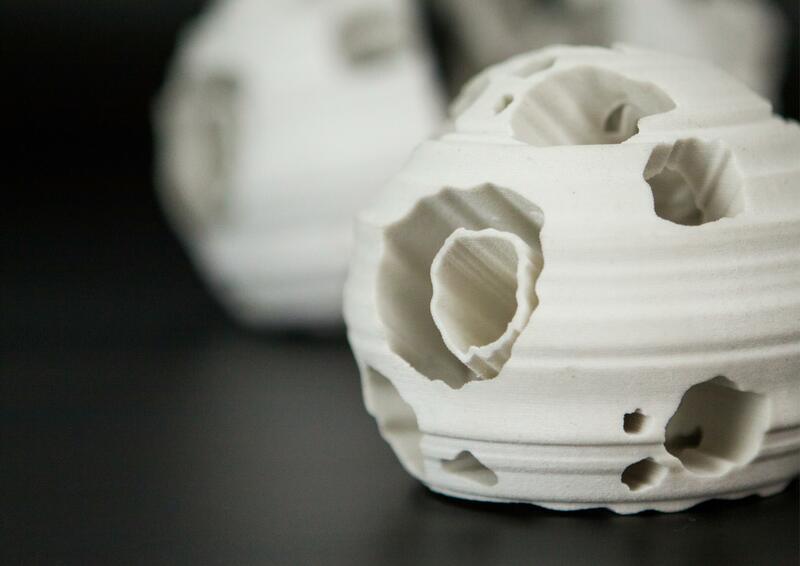 The research process requires a consistent standard of material in order to replicate techniques, however Julia uses co-design processes to create her work, and is promoting open-design strategies to further share her research and work processes with craftsmen from other disciplines, and ultimately geographies. So, in time Julia’s techniques could be shared with other seafaring communities to explore their craft heritage and techniques in this medium. As I swim off the coast of the British Isles, I will look upon the seaweed fields swaying in the currents with a renewed appreciation next summer! What a wonderful substance that slippery seaweed it. There are further open studio sessions this week, and a seminar on Friday 20th September, as part of the London Design Festival. 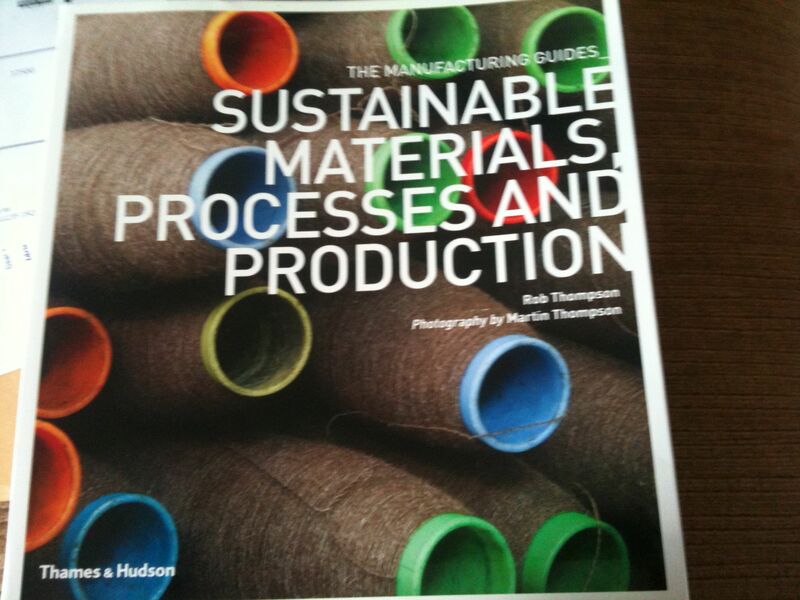 It does what it says on the cover – a guide to sustainable materials, processes and production techniques. Manufacturing and production methods are changing (more of that later), and in a bid to better understand how design can be produced efficiently and in an environmentally sensitive way, I set myself some homework. The book, by Rob Thompson, describes the environmental impact of materials, manufacturing processes and product life cycles. From injection molding bioplastic to water-based printing, 15 materials, 14 processes and six production lifecycles are illustrated with case studies. After my course on the circular economy with the Ellen McArthur Foundation, I want to see where the theory can meet with best practice! The book is published by Thames and Hudson and retails for £16.95.